You are at:Home»Seattle Mariners»Pacific Northwest Baseball Is BACK! Its April, baseball is back in the Pacific Northwest, and it’s a glorious thing. First, our Seattle Mariners played two games against the Oakland Athletics in Japan, winning both and officially opening the MLB season. Last week, the rest of the league kicked off games of their own, and wouldn’t you know it, the M’s kept on winning. They went 3-1 against the defending World Series Champion Boston Red Sox and swept a 2-game series against division rivals, the Los Angeles Angels. Let’s enjoy the 7-1 record for what it is: a stunning, inspiring, and best-team-in-baseball start to the season. But the Mariners aren’t the only team in town looking to delight fans with a winning brand of baseball; you need only look 30-miles south of Seattle to locate the beloved Tacoma Rainiers. During the offseason I moved to Tacoma, resulting in tremendous excitement to spend a season watching my new home team crush in Triple-A ball. Not only will several current, former, and (most exciting) future Mariners be rostered on the Rainiers but having a new stadium to explore and gameday experience to appreciate will be invigorating too. Beyond being the official home of the Rainiers, the stadium also hosts a United Soccer League team, the Tacoma Defiance, and a National Women’s Soccer League team, the Reign FC. Consequently, the stadium is undergoing several dual-sport adjustments in preparation for upcoming baseball games. Currently, a feasibility study is underway to study plans for an adjacent, soccer-focused stadium. If approved, the current design would have an approximate capacity of 7,000 and be ready to host matches in the 2021 season. A few months ago, I applied for media credentials with the Rainiers, and to my delight, I was approved. 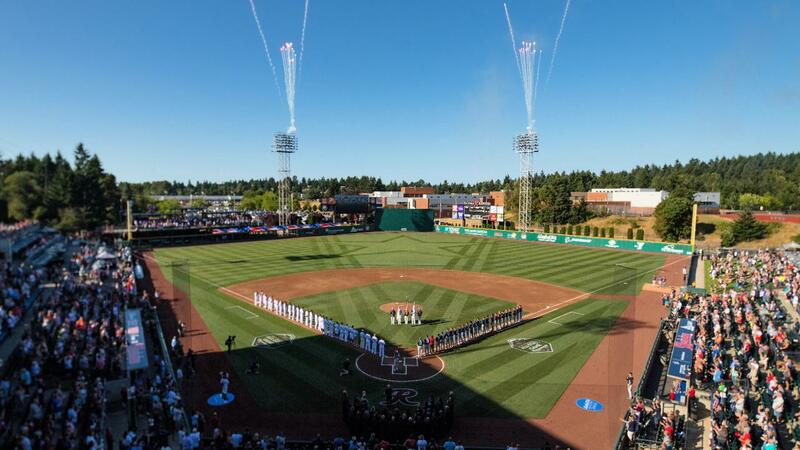 So, I’ll be spending as many summer nights as possible at Cheney Stadium watching and rooting for the Rainiers in Tacoma. And I can’t wait to track with the utmost scrutiny, which players get called up to and sent down from the Mariners at T-Mobile Park in Seattle. What more could a baseball fan even ask for? Next up for the Mariners is two very winnable stops on the road against the Chicago White Sox for 3 games and the Kansas City Royals for 4 games, before coming home to face the projected division winning Houston Astros on April 12th for 3 games. So, between the Rainiers in the south sound and the Mariners up north, there’s an abundance of baseball to watch, listen to, or just following in the standings. Baseball is back, and it’s going to make for a spectacular summer.